You're on Twitter and are using it to promote your blog and build community, right? I'll also assume that you're posting links to your blog's content on Twitter, either by hand or via Twitterfeed. Because of the 140-character limit on Twitter, you're probably using a url shortener on Twitter more than on any other social media platform. Bit.ly is a popular url shortener (like is.gd or tinyurl) that lets you see how many clicks your links are getting on Twitter or wherever you post a bit.ly link. Studying how many clickthroughs each of your bit.ly links receives gives you valuable insight not only about how successfully you're using social media but also about which posting techniques are working for your blog. Get to know your bit.ly dashboard. 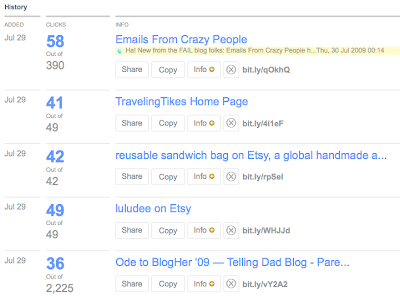 At bit.ly, you'll see the stats for each of your links once you're signed in. The blue number shows the number of clicks your link has received, and the gray "out of" number below shows how many clicks to that long url (the url your bit.ly link points to) has gotten. In the "Ode to Blogher" link below (which was to a really funny video on another site), you'll see that my bit.ly link received 36 clicks out of the 2,225 clicks that went to that link via other bit.ly users. The Ode to Blogher post was quite a popular post for Telling Dad! Click on the blue number and you'll see a chart that shows you what time those clicks came in. Below that, you'll see all the bit.ly links which point to a specific long url on Twitter and FriendFeed as well as how they were used. Click on the gray "out of" number and you'll see when and by whom those links were posted. If you're posting links to your content on Twitter via Twitterfeed, you can still track your links. Twitterfeed uses bit.ly and displays your clicks beside each link on your dashboard. Unfortunately, stats showing the total number of bit.ly links going to a particular long url are not available on Twitterfeed. My own stats tell me that the "drier" the text of the Tweet, the fewer clickthroughs it gets. Tweets that are questions, Tweets with humor, and Tweets with a bit of mystery ("you won't believe what I've been doing this morning") get much higher click through rates. Tweets about my posts averaged 32 clicks, where as other non-Baby Cheapskate links I've posted (as seen in the graphic just above) have fared slightly better at about 39 clicks per link. By looking at the text of the non-BC links, I can get an idea of what it was about them that was more attractive to Twitter followers than my blog post titles. I can chart the average clickthroughs over time to see whether I'm improving. If I post bit.ly links to my posts by hand (rather than via Twitterfeed), I'll be able to see how many other people linked to my post using bit.ly on Twitter and Friendfeed. I can see at what time of day my tweets get the most clickthroughs and time promotional tweets to take advantage of higher Twitter traffic. I can determine whether the number of clickthroughs I'm getting justify the time and energy I'm spending promoting my blog through social media. Tracking the success of your blog posts on Twitter and Facebook with bit.ly can help you craft more engaging blog post titles and promotional Tweets. Using bit.ly within your blog itself can help you write blog posts that really grab your readers' attention. Placing bit.ly links within your blog rather than long url links can help you determine which of your posts motivate readers sufficiently to click on your links and which fall flat. Look at the stats on bit.ly and ask yourself how those posts are crafted: Does the link get more clicks when it's at the beginning or end of the post? What is it about the wording of that link, paragraph, or post that makes it successful? Do posts early in the week get more attention than posts on Friday? Bit.ly even has an Amazon Associates plug in for Firefox which allows you to convert Amazon Affiliate links to bit.ly links with a click. Knowing how many readers click on a link versus how many buy a product is quite valuable (though sometimes those stats are available through the affiliate company's site as well). In short, your Twitter follower count tells you how many users are presumably interested in what you have to say, but if your message has more than 140 characters, you need them to click. Bit.ly can help you reach out to these potential readers in a way that makes them want to. Once readers arrive at your blog, bit.ly links there provide essential feedback about how and how often readers interact with your site. So, BlogCoach readers, how do you use bit.ly? Can you think of any other uses for trackable urls? Join the discussion in the BlogCoach Community: What percentage of readers/followers/FB fans actually click on your links?